Why is this ingredient so prevalent in processed food? High fructose corn syrup is inexpensive to make and we have become, quite possibly, addicted to the sweetness. Should we be paying more attention to how much we are consuming? According to many health care providers and nutritionists, we should not only be paying attention, we should be reducing or eliminating high fructose corn syrup if we want to stay healthy and avoid chronic diseases. Commonly referred to as HFCS, this sweetener accounts for more calories than any other food in the American diet. Unless you are aware of the health concerns regarding this highly pervasive food additive, your refrigerator and pantry may be full of products that list HFCS as an ingredient, often the first or second ingredient on the list. For consumers who are concerned about their health, HFCS has become a food nemesis to be avoided at all costs. Food manufacturers would like us to believe that HFCS is healthy because it is made from corn. However, the dried, shelled corn kernels that are used in the conversion to HFCS are so heavily processed with additives, the end result is nothing resembling those sweet ears of corn you may have enjoyed on a warm summer day. Through a series of processes and the addition of sulfurous and hydrochloric acids, corn starch is converted into ordinary corn syrup containing dextrose sugar. To convert corn syrup into HFCS, it undergoes further processing called enzyme conversion. 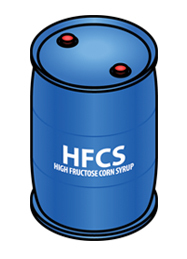 This produces HFCS with a 42% fructose content to be used in canned fruits and condiments. With additional processing, an even sweeter 80 -90% syrup is produced, which is added to “light foods” where only a small amount of sweetener is required. A 55% fructose blend is added to soft drinks, ice cream and frozen desserts. Further evaporation of the 80 – 90% fructose creates pure 100% fructose crystals which are used in cake mixes and other food products, where a highly concentrated dry sweetener is desired. Whew! Wouldn’t you rather just add a spoonful of sugar to satisfy your sweet tooth? Your liver wishes you would. While all body cells can use glucose for energy, only the liver cells can break down fructose. One hundred years ago, the average American consumed 15 grams of fructose or about half an ounce daily, largely from fruits and vegetables. Today, adults average 55 grams per day, and for children and adolescents an even more worrisome 73 grams per day. This high fructose intake parallels the rise in obesity, diabetes, and nonalcoholic fatty liver disease. With too much fructose, the liver produces triglycerides, which can build up in the liver cells and damage liver function. High levels of triglycerides in the blood stream can contribute to the development of fat-filled plaque, which clogs artery walls. Other health damaging effects include increased uric acid production, which interferes with nitric acid production necessary to protect artery walls, and the formation of free radicals that can damage cell structures. Excessive fructose intake is linked to insulin resistance, the precursor of diabetes. Emerging science shows that HFCS consumption may have negative effects on the human protein leptin, causing leptin resistance, which prevents the brain from properly controlling hunger and results in overeating and weight gain. Most importantly, become a label reader. You may be surprised when you see that many of the foods that you think of as healthy, such as yogurt and whole grain cereals, contain HFCS. Choose the foods you want and then choose brands or substitutes that don’t contain HFCS. You can find HFCS-free breads, condiments, cereals, salad dressings, peanut butter, cookies, ice cream and more. Avoid drinking soda on a regular basis. Soda consumption is one of the biggest culprits when it comes to added sugars and calories. You can make your own refreshing beverages by adding seltzer to a small amount of fresh fruit juice. There are also soda brands that do not contain HFCS. Eat more fruits and vegetables better known as whole foods. Natural sugars in these foods will provide the energy you need without all the harmful side effects. Drive through the drive though less often. From sauces to salad dressings to desserts and breads, fast food products are loaded with HFCS. Cook at home more often. When you prepare food from unprocessed, fresh ingredients, you can avoid HFCS and get the benefits of the nutrients, vitamins, minerals and fiber contained in whole foods. Most processed foods contain HFCS along with additives and preservatives. Don’t be fooled. HFCS by any other name is still HFCS. Other ingredients to watch for include maize syrup, glucose syrup, glucose/fructose syrup, tapioca syrup, isoglucose, fruit fructose and crystalline fructose. This entry was posted in Health & Wellness, Home and tagged High Fructose Corn Syrup. Bookmark the permalink.